Montour SD is preparing students for success in the 21st century by offering a new middle school program in Artificial Intelligence (AI) – the first of its kind in the nation. According to an article about the Montour AI program on GettingSmart.com, students will be able to explore and experience AI, using it to cultivate, nurture, and enhance initiatives aimed at increasing the public good. The initiative is housed in a 3,000-square-foot classroom at the district’s David E. Williams Middle School. Montour partnered with parents, students, community members, higher education representatives, technology providers and more to bring the program to life. Content taught will include data literacy, autonomous robotics, AI virtual assistant, STEM inquiry skills, AI ethics, moonshot thinking and career awareness. Students can also learn about the arts, specifically Amper Music – an artificial intelligence composer, performer, and producer used to create and customize original music. Computer AI courses will be offered, including Introduction to Pattern-Finding through Gaming and Recognizing Computer Patterns Virtually and Through Algorithms. 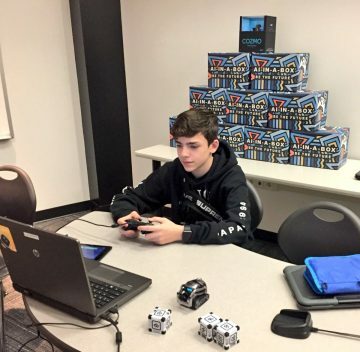 Partnering with Carnegie Mellon University, students will get a hands-on introduction to AI topics using the Calypso for Cozmo software framework and the Cozmo robot by Anki. In addition, students will learn data literacy skills through Earthtime, underpinned by Carnegie Mellon University’s CREATE Lab, to inspire meaningful dialogue, and democratize access to data for everyone in an inclusive and transparent way. Students will be able to interact with data using multiple data sets on a Promethean ActivPanel. Montour School District also is the new home to the World Artificial Intelligence Regional Competition for Youth. The competition uses autonomous robotics to demonstrate a scenario where an AI robot can change lives.